The Genealogy Research Department for Allegan County has a number of in-depth resources for those interested in finding out more about the county's vital records. It is located within the County Clerk's office, on 113 Chestnut Street, in Allegan, MI., and it allows research Tuesday through Thursday, 8:30AM till 4:30PM. Birth and death records are available from 1867 to the present. Marriage records are listed from 1836 to the present, along with divorce records from 1900. Also, the 1860, 1870, and 1880 Censuses are available to research. The department charges $10 per certified copy, and $4 for additional copies. The office limits three researchers at a time due to office space limitations. 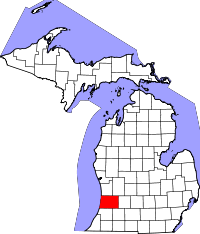 Primarily an agricultural center, Allegan County is fast becoming highly populated and urbanized as Grand Rapids and Kalamazoo are both expanding into the county. It also offers a number of state parks and festivals, further drawing in more residents.